Superliga leaders FC Copenhagen aren’t resting on their laurels following the revelations that tank forward Andreas Cornelius is on the brink of joining Italian outfit Atalanta from next season. The Lions, who are chasing an undefeated Superliga season and lead the league with a comfortable 13 points, announced today that they will bring in Cypriot striker Pieros Sotiriou from next season. Sotiriou, 24, is currently enjoying a solid season with APOEL Nicosia, having scored 23 goals in 43 appearances in all competitions, including one against FCK when the two clubs met in the Champions League qualification earlier this season. “I’m very happy to have signed with FCK and I will do my best to bring the club more success. 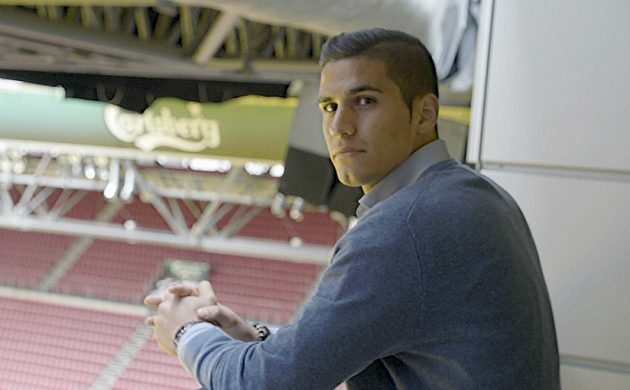 I hope to score many goals for FCK,” said Sotiriou. The strong striker has also earned 19 caps for Cyprus and is currently valued at 1.2 million Euro, according to Transfermarkt. FCK coach Ståle Solbakken is pleased with the signing, which he contends will boost the Danish champions in a number of areas. “We’ve found a striker who has a little bit of everything and has the profile we are looking for in a striker,” he said. See his first interview below (in English).